This month in our Mapping for Good series we’ll take a look at how one university is using existing infrastructure and resources to map a whole city. City Scanner, a project from the Massachusetts Institute of Technology (MIT) and the City of Cambridge, MA, seeks to capture the “spatiotemporal variation in environmental factors” around the city. So what exactly does that entail and how are they going about it? Let’s take a look! City Scanner is just one of many ongoing projects across America’s urban locales seeking to play a role in the emerging “smart city domain”. A smart city is defined as a, “Municipality that uses information and communication technologies to increase operational efficiency, share information with the public and improve both the quality of government services and citizen welfare.” Rather than having to fund and deploy an entirely new fleet of vehicles to collect data, the MIT team decided to mount various environmental sensors on garbage trucks. After only several months, the entire city of Cambridge had been mapped! A screengrab of the web-based City Scanner application, with the Thermal Imaging field highlighted over Cambridge, MA. The multiple sensors on each of the six trucks measured a variety of metrics, including air quality, the thermal flux of the built environment, particulate matter, temperature and humidity, and road quality. As more and more data was collected, the team was able to represent their collected data visually for both residents and researchers to experience. Temperature & Humidity: City Scanner includes low-cost temperature and humidity sensors that can be used to understand pedestrian activities as well as heat islands in urban areas. Road Quality: Using accelerometers, City Scanner identifies road quality based on vehicle vibrations. City Scanner literally creates a roadmap for improving roads. 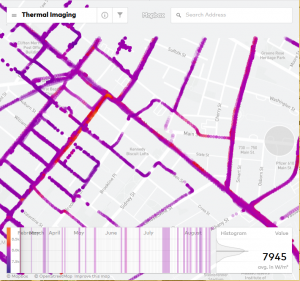 Thermal Imaging: Thermal imaging can be used to assess the energy efficiency of building envelopes, monitor infrastructure, and study the impact of anthropogenic heat in the cities (e.g. Urban Heat Island effect). Particulate Matter: City Scanner counts particles in different diameter size bins (PM10, PM2.5 and PM1) using a small laser. The particle counts are an indicator to determine signatures of different pollution sources. This data can inform epidemiological research and urban health policies. Great question! This project, among others, gives us a glimpse into an entirely new future of decision-making. By using high-tech sensor technology in conjunction with a low/no cost (no cost in the sense of nothing needing to be added to existing infrastructure and systems besides the sensors themselves), MIT has shown that little needs be built in order to gain a vastly more accurate understanding on one’s city. From the collected data, researchers are then able to identify gaps in service across the city. The possibilities are, well, endless! This entry was posted in The Geospatial Times and tagged Mapping For Good, MIT, The Geospatial Times, Tips & Tech by Apollo Mapping. Bookmark the permalink.